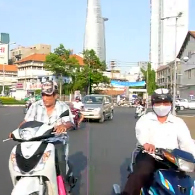 Some say that Ho Chi Minh is a boring city and there isn’t much to do. I beg to disagree. For such a “boring” city, there were so many things to do! 1. Talk to the locals! It may seem awkward but locals usually approach tourists in the park to practice their English. They aren’t the best in English but they acknowledge the need to learn and be good at it. Random conversations in the park between locals and tourists. There are countless of street vendors selling authentic Vietnamese food. Sit on the little stools and eat with the locals. Hopefully your stomach’s up to the challenge. Even if we had a hard time conversing, we both agreed that the food deserved a thumbs up. Check out the different Vietnamese food I ate here. 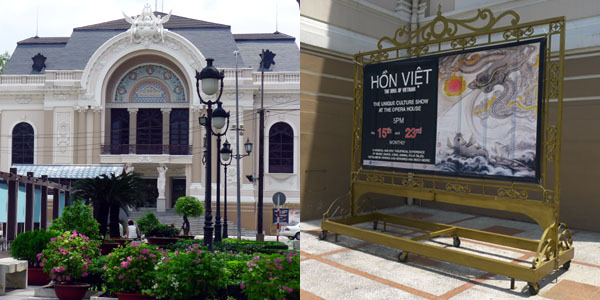 If you're there on the 15th or 23rd of the month, watch Hon Viet, a cultural show. Too bad I missed this. At least your experience of the opera house won’t be limited to its facade. 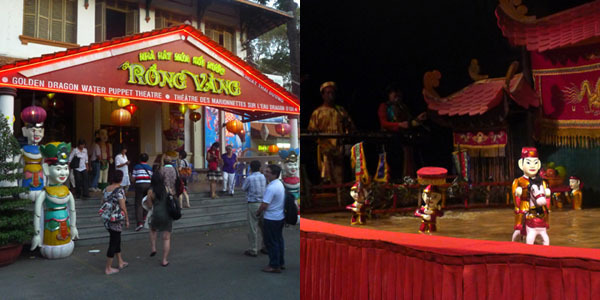 Hon Viet ("The Soul of Vietnam") is said to be filled with traditional Vietnamese songs, dances, and folk tales. Your stay won’t be complete without doing this. If you want a challenge, try the Ben Thanh market rotunda. Cross at your own risk, though! Remember: motorists generally avoid you. Motorists about to avoid me. 5. Drink along the backpacker's area! Stools and tables are set up along the sidewalk and beer is extra affordable. It’s a great place for people watching! Here, the night is forever young. Even when alone, you won't feel left out. Don’t worry. Not all massage places are sleazy. If you want a Greek-ambiance, an exclusively male crowd with cute masseurs, try going here. Very professional. No "happy endings" here. 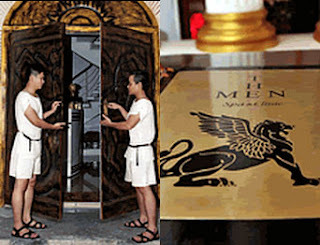 One-hour massage = 300,000 VND (~Php 600). Minimum tip = 200,000 VND (~Php 400). Motorcycles are the main mode of transportation. It’s worth doing for experience. Rent one to ride for yourself at 100,000 VND a day (~Php 200) or hire one to take you around. I hired a tour guide for 100,000 VND (~Php 200) per hour. He took my picture. 8. Hunt for cheap finds! Shop along Pham Ngu Lao St. or Bui Vien St. for souvenirs. Other places to shop: Ben Thanh market, Saigon Square, Saigon Tax Square, and Bin Tay market in Chinatown. See the souvenirs I bought here! It's like our Starbucks. It's everywhere. But if you want some extra peace and quiet, try hanging out at the one in Saigon Tax Square and enjoy the view of the Parliament and Opera House. The view from Highlands Coffee in Saigon Tax Square. Admittedly, this isn’t for everyone. But for those who like some local culture, this is a nice experience. There are numerous shows in a day. Each show is 45 minutes long. Surprisingly, there’s a place in the city that’s quiet and practically motorcycle-free. It’s like High Street. Whether by yourself or with a date, this place is perfect for being emo or cheesy. Starlight Bridge at night, District 7 across Crescent Mall. Friends have told me that it's nice to watch the sunset from here. For those who've been to Ho Chi Minh City, what other activities do you suggest?